My therapist gave me this “prescription” today, and said “go get it filled, unlimited” … it says “Take one a day as needed – “I am a good person, love by God, Friends, Family and Support”. He tried to make the symbol on the top a RX but it turned out to be P* which I found out later on from my sister means “CHRIST”. how ironic is that? I guess God does show up in unexpected ways; ways that we are meant to see him. Last night’s blog post was hard; even harder to keep the post up. The moment I woke this morning it was that sick in the stomach feeling like “oh… what did I do?” .. but then I said to myself “NO I am going to keep that truthful post up, I am going to go about my day, and continue to be with the okay-ness in the struggle. Taking that one big step last night, will lead to another step, and that step will lead to another step forward. One foot in front of the other and keeping in mind just what the prescription says – accepting goodness. I didn’t know what to do BUT to turn to the pain pills, and before I knew it, it turned on me. I sought out the help needed, and my heart Dr admitted me into the hospital to safely get me off the pain meds … it was hell, but I needed to do it before it completely took me into a place where there is no moving forward, its a life of standing still. It took a good month to detoxed from the pain meds and moved out of that horrible cycle of wanting relief, and I found relief in other ways – like continuing to show up to therapy and working hard in my healing, staying connected to the few people I really am close to instead of turning to the pills. I kept writing even though writing was the “reason” this whole year had happened. I fought for my voice and continued to move forward, even in the hard struggle. I am coming up on a year clean from those horrible pills, and I have to say, no matter how hard the struggle is right now, it’s not worth it. What is worth it is the prescription of goodness my therapist gave me today on a little piece of paper, with a loving and caring reminder – “You are a good person, Loved by God, Friends, Family and Support”. No pill can do that, it may try, and it sure acts like it can, but in real, it’s the enemy. I can’t say I haven’t thought about it in this hard struggle I have been in (especially the past couple months), but when I am feeling that “urge” for numbness or relief, that is when I reach out to support, and write, and find relief through God and self prayer. I do feel my post last night opened up a huge step for me, and what I have always learned is – once a step is made, others follow ahead. So I will take this prescription of goodness my therapist gave me, embrace it, use it, read it, and believe one out of 10 times the goodness it holds. This is what I can do in this moment, in this step; even if it’s still in the struggle, it’s still a step forward. Karen – yes a step forward even in the struggle is still a step forward. You are lucky that you caught the “addiction” before it became something bigger, not too many people have the will to stop something that makes them feel above the problems that fired it. The past and what surfaced is the healing step, that is the step forward. I agree! I am not healing “what happened” in the past year, I am past that, done with it, moved forward from it.. I am not wasting anymore energy on that .. what I am focusing on is what surfaced from this, and how I can move forward from THAT because THAT is what is important! What a great affirmation and reminder! I will need a prescription for the same! It’s almost like those photos people hang and it says “Take One” hahaha. 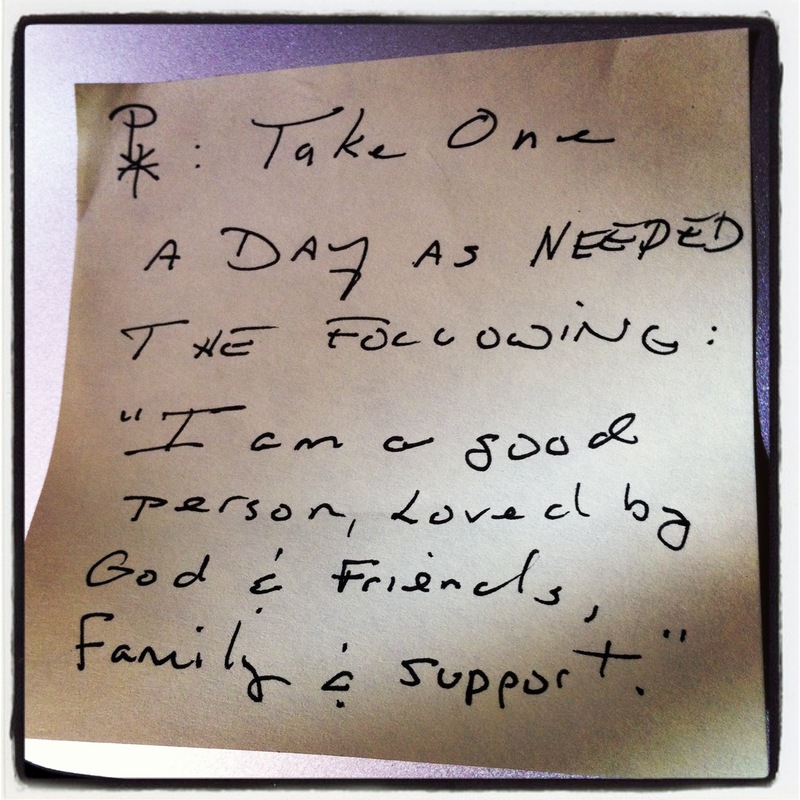 I love that sticky note, and soak it in, because it’s true! Shannon! yes I know what you mean. I saw one at the Kroger once, someone had hung one on the bulletin that had a heart and said “love” please take one .. it was cute :) ..
Hi Karen, I didn’t see this post, glad I checked and found it. Wow do I understand about seeking relief in the wrong places. I am so happy you reached out for help when you did. Addictions are so hard to get free from. Gentle Perseverance: Continuing on a chosen path, even in the face of great difficulty…while being kind and gentle with oneself. I added the ‘gentle’ to it, because I needed something to counterbalance the idea that perseverance can be drudgery, harsh or bland.